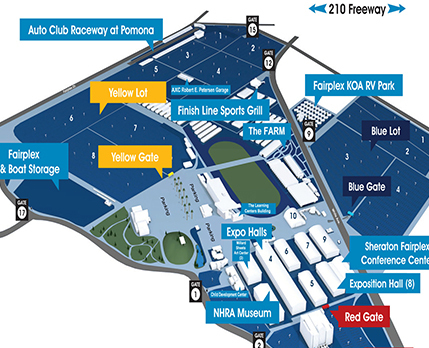 Fairplex is located in Pomona and is conveniently reached from all points in Southern California. Easily identifiable Fairplex signs are located throughout Pomona and neighboring communities to direct motorists. Directional signs are also prominent along nearby freeways. Enter at Gate 17. East on Ventura Freeway (134) to the Foothill Freeway (210) and exit at Foothill Blvd. Turn right on Wheeler Ave., proceed south to Arrow Hwy. and turn left. Follow directional signs to Fairplex. Enter at Gate 17. South on Golden State Freeway (5) to Ventura Freeway (134). East to Foothill Freeway (210) and exit at Foothill Blvd. Turn right on Wheeler Ave., proceed south to Arrow Hwy. and turn left. Follow directional signs to Fairplex. Enter at Gate 17. East on San Bernardino Freeway (10) to the city of Pomona and exit at Fairplex Drive. Turn left on Fairplex Drive and proceed to the Fairplex grounds. Or, exit at White Avenue and turn left and proceed to grounds. Enter at Gate 17. South on I-15 to Foothill Freeway (210). Go west and exit at Fruit St. Turn left on Fruit Street and proceed south. Fruit Street turns into White Ave. Follow directional signs to Fairplex. Enter at Gate 17.